Apple today announced a refresh of its iPod line, with new models of the iPod Shuffle, iPod Nano, and iPod Touch. The iPod Touch adds the iPhone’s 960×640 IPS “Retina” display, A4 processor, and gyroscope. It also adds front- and rear-facing video cameras, designed for use with Apple’s “FaceTime” video chat software. Prices are $229 for the 8GB model, $299 for 32GB, and $399 for 64GB. 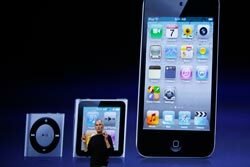 The iPod Nano has the most drastic change: its size was cut roughly in half so only the screen remains (no more click wheel). The screen is now a touchscreen and has a home screen with specialized “apps” (like audio and photo players), but it won’t run normal iPhone apps and games. It gains FM radio capability and Nike+ pedometer support, but it loses its camera and the ability to display video. The prices are $149 for the 8GB version and $179 for the 16GB. It now has a clip like its smaller Shuffle sibling. Finally, the iPod Shuffle actually gets its clickwheel back, but otherwise remains largely unchanged from the last version. It holds 2GB and costs $49. Of note, the iPod Classic hums along unchanged, at $249 for a model with a 160GB hard drive.